A quiet family vacation in Jerusalem turns into high adventure as Ilana and Ari Goldreich set out on an unforgettable quest through time. Sent on this mission by a mysterious man in white, and pursued by an evil man in purple, they must face danger – and learn lessons of friendship, courage, and other Jewish values – in order to save the world from deadly peril! With its fast-paced plot by two bestselling children’s authors, and its extraordinary illustrations by an award winning Hollywood animator, Search for the Stones takes Jewish children’s literature to a completely new level. 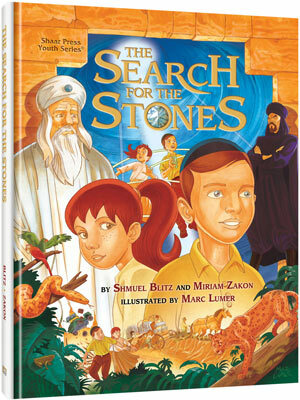 Search for the Stones will teach young readers Torah values even as it ignites their imagination. And it will teach them the wonders of reading, as it sends them on a quest they will never forget.